The Ruff Landscaping Design and Installation teams are one of the best in the Chicagoland area and are equipped to handle any project size. Our designers and/or architects will meet with you to understand and help select landscaping that is tailored to your lifestyle and budget or we can use your existing plans. Then, our experienced installation team will bring that plan to reality. Our installation project manager will oversee every phase of your project to unsure the installation is completed to your satisfaction. We can install everything from Softscape material to the most extravagant outdoor living areas and we use only the best material possible. Ruff Landscaping, Inc. offers a five year guarantee on all of our stone/paver installation work. We also clean, seal and repair existing brick pavers. The Ruff Landscaping Design and Installation team is one of the best in the Chicagoland area and is equipped to handle any project size. Our designers and/or architects will meet with you to understand and help select landscaping that is complimentary to your property and budget or we can use your existing plans. Then, our experienced installation team will transform your property to an appealing, approachable and professional site. Your project manager will be in constant contact with you every step in the process to ensure your satisfaction. 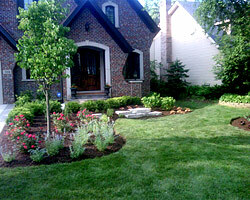 Ruff Landscaping, Inc. offers a five year guarantee on all of our stone/paver installation work. We also clean, seal and repair existing brick pavers. Visit our portfolio for a complete gallery of ideas for your next project.